With the new TPS/i CMT welding system, technology leader Fronius is combining the smart functions of its latest power source platform with the advantages of the most stable welding process. The Cold Metal Transfer welding process produces outstanding results with diverse materials while the innovative TPS/i MIG/MAG power source impresses with its extensive range of settings and applications. Users benefit from significantly improved efficiency and quality with the new system. The centrepiece of the TPS/i CMT is the new and improved PullMig welding torch. Not only is it lighter, more robust and more durable than its predecessor, but above all it is cooler. As well as wearing significantly more slowly, the welding torch also impresses with its more stable arc. Fronius has also optimised the wirefeed through the addition of a dynamic and precise servomotor. 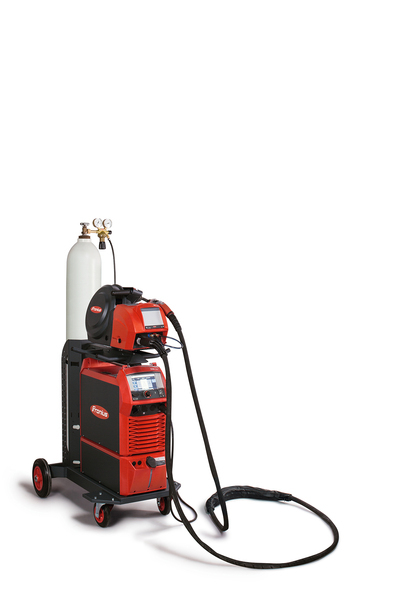 This allows the push-pull welding torch to work in perfect harmony with the TPS/i’s rapid arc control. Ease of use has not been overlooked either: the handle of the welding torch no longer needs to be opened in order to thread a new wire. The CMT welding process significantly reduces the heat input in comparison to other MIG/MAG processes. This results in spatter-free material transfer yielding optimal welding results. The process offers particular advantages when joining different materials, for example steel and aluminium, as well as sheets of a lighter gauge. Its combination with the intelligent TPS/i power source opens up an even greater range of application areas. Numerous settings options allow the heat input during welding to be precisely regulated, while the gap-bridging ability and penetration profile can be optimised. The combination of different settings parameters results in a wide range of applications for the universal and mix characteristics saved in the power source, which mean that user-defined characteristics are usually no longer necessary. This also makes it considerably easier for the user to select the appropriate welding program. The enhanced range of options will most of all benefit users who regularly need to weld different materials, such as repair work. The TPS/i CMT is designed for all types of materials and is able to produce sheet joints in thicknesses from 0.5 to 6 millimetres. The welding system is also intended for use with components of different shapes in small batches, where robot-assisted welding is not financially viable. Existing TPS/i power sources that already have the Standard and Pulse function packages installed can easily be upgraded for the CMT process.